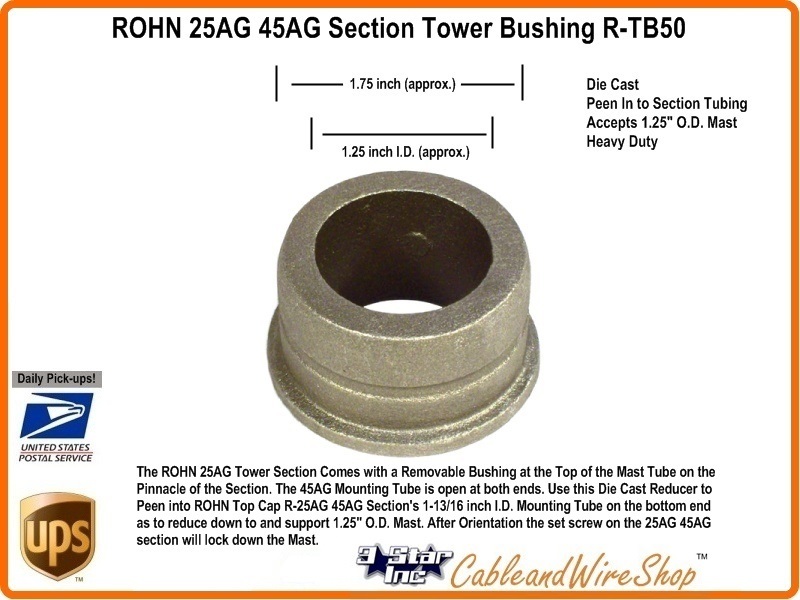 The ROHN 25AG Tower Section Comes with a Removable Bushing at the Top of the Mast Tube on the Pinnacle of the Section. The 45AG Mounting Tube is open at both ends. Use this Die Cast Reducer to Peen into ROHN Top Cap R-25AG 45AG Section's 1-13/16 inch I.D. Mounting Tube on the bottom end as to reduce down to and support 1.25" O.D. Mast. After Orientation the set screw on the 25AG 45AG section will lock down the Mast. Consult ROHN Catalog Links at Footer Section below for ROHN Tower Details. The ROHN 25AG Top Cap Section comes from the Factory with a rudimentary 1.25 inch reducer bushing installed at the top of the 2.00 ich O.D. Mast Tube at the Pinnacle of the Section. It is removable for other uses or replacement with other sized Bushings. The 45G mounting Tube is open at both ends. Purchase and install this Die Cast Reducer to complete the Mast Tube acceptance and mounting of a 1.25 inch O.D. Antenna Mast. ROHN TB75 is a Die Cast Reducer similar to this one that can be peened in place at both ends to accomodate a 1.50 inch O.D. Antenna Mast.